We are looking for a composer, to make original orchestral music to a fantasy roleplaying game module. Interested? Read further! We are a bunch of guys from around europe and we are making a non-commercial expansion module for NWN (= Neverwinter Nights, more info at BioWare.com). We are searching for a talented composer to compose a new score to the module. The more original music we can get, the better. The ideal situation would be that you could provide us with all the music we need. We have many strong and emotional scenes which would require intense music and the ability to follow instructions (given by us). Don't worry, we're all nice guys We will need different kinds of orhestral music to fit the big scale of emotions we will have in the module (everything ranging from furious battle music to sweet summertime tunes) and we hope you would be our man (or woman). Our module will be a 3-part saga, and some themes from Chapter 1 will be appearing in chapters 2 and 3 too. We would like to be able to keep the same composer in the later chapters also. Unfortunately we cannot offer anything else but our gratitude and the name of composer in the credits. If you do not know what kind of music we are after, just listen to some of Jeremy Soule's fantasy stuff and you'll get the idea. We don't conscider this module just as your normal, hack-and-slash dungeoncrawl-kinda module. We think this as a whole new game, because of the sheer amount of playability and complexity involved. Further information of the NWN custom-module "The Moonlight Path" can be attained from the official website (under construction). If you know how to use IRC, please come and visit us at #NWN.Project (click to connect) at the QuakeNet IRC server. If you are not adept in the ways if IRCing, use the Java-IRC on our site. One click and you will be chatting with us in real time! Amazing, is it not? 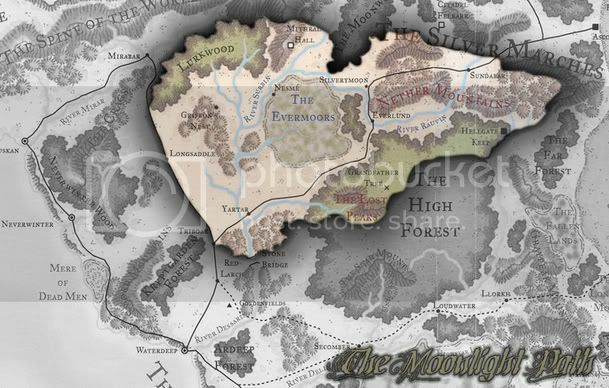 The adventure takes place in Forgotten Realms in the realm of Faerûn. You can check the play-area (Chapter 1) by clicking here. If you are still interested (and who would not be? ), email me to t3h@moonlightpath.org! If you have anything you'd like to ask us, please feel free to email me or come to our IRC channel. And please, feel free to post your questions/comments here. I have email notifications enabled, so it won't take me long to answer. Thank you for your interest towards our project. I believe there will be an announcement made soon which will be most interesting for people such as yourself. I'll not say anything more just yet, but I will post here when the accouncement is made. Guess I'll just have to wait for the post. Patience is a virtue, after all. Are you interested in writing music for this, Funkmaister? Hmm, perhaps I should move this thread to the Mod Projects forum. I'm moving this thread to the Mod Projects forum. Let me know what develops, please. Edit: By the way, the website for this project appears to have changed to http://HTTP://MOONLIGHTPATH.ORG. I have informed t3h project leader of the project of your interest, so he should probably get back to you soon. Hmm, well, it appears that this project may not exist any more. I have been unable to receive any replies from them. How about you, Funk? They may have gone the way of the dodo. Those who might be interested in the mod, we are still alive and recruiting. We also have heavy plans for Neverwinter Nights 2. I am the project founder and the one who keeps it all running mostly. weltanschlauung@gmail.com . I shall reply as soon as I can. If you wish to have any material seen, ask me directly, as we got no websites nor forums online anymore, due to many a reasons. PS: Those who use IRC come and join us on #NWN.project channel on quakenet server. For a quick sample, check the link below! The knowledge that you exist is a burden upon my soul..."
Hello Mathazzar, are you the composer for this project? If so, please provide more details, I am eager to hear more about the project's development. I had wondered if the project were still developing, as I had not heard anything for quite some time. Yes I am the composer for this project, new to the site and fairly young for a composer I guess (sweet...15). This project is very much alive and is slated for a June release date as far as I'm aware. I have been busily working on the music and will hopefully be able to complete everything within the given time period .